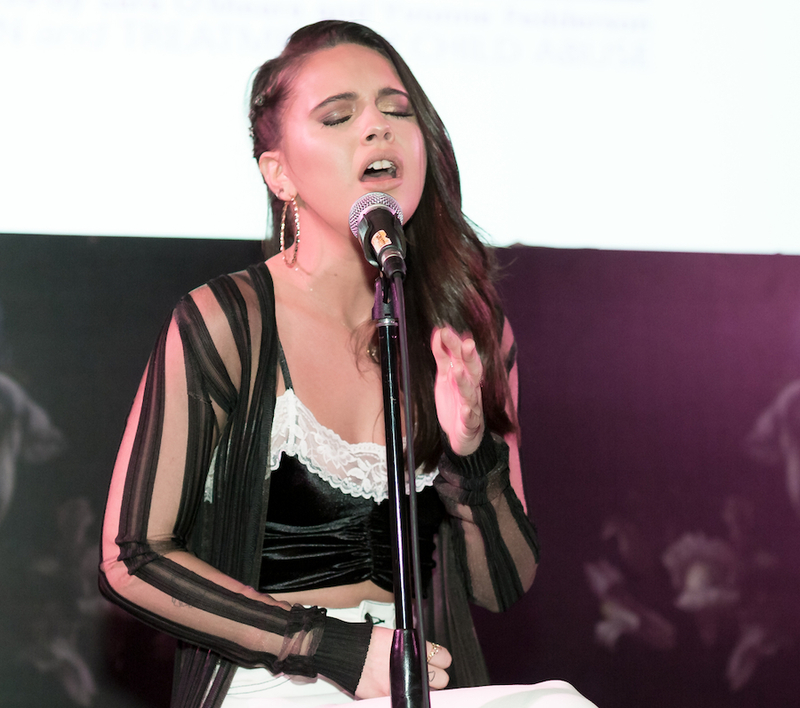 After teasing us with her 3 EPs -- Chapter One, Chapter Two, and Chapter Three -- Bea Miller finally brings all those songs together along with new ones to show us sides of her we have not seen in the past in her sophomore album Aurora. She wrote the majority of the songs on the album and wants people to experience her emotions ranging from sadness, loneliness, anger, empowerment, happiness, freedom, and being confident. Here’s a breakdown of the album track-by-track! With a catchy chorus, Bea is hurting from a relationship. In it, she compares her love interest to things such as ripple of waves rising to a hurricane to the loss of color. In the verses and chorus, we can see she cannot get that person out of her mind as much as she is trying to. This is the ideal break-up song for someone who is dealing with a mix of feelings. Remember the nursery rhyme “London Bridge Is Falling Down"? Well, in this song, Bea brings a similar melody to embody her anger of a past relationship. She tries to burn the bridges they once had though she is struggling to let go. She keeps the literal meaning of the bridge by saying she’s drowning underneath the water -- in other words, she misses the relationship they once had along with all their memories. Get your tissues ready before you listen to this song! In this song, we see a different side of Bea, a more independent Bea who has moved on from her love interest. Though she admits to wanting that person, she realizes that all they have done to her is harm. She is able to be more than just someone’s hook-up and learns to love herself in all the senses of the word. Bea struggles to free her mind and self from a recent breakup. Her soft voice in the lyrics of this ballad gives us chills! The simple piano in the background allows us to focus only on her amazing voice. She is sad and vulnerable in this song, a bit different from the fearless Bea we are used to seeing. For everyone who believes in the phrase “what doesn’t kill you make you stronger,” this is the song for you! Bea is over feeling sorry for herself and decides to force herself to be stronger and to feel better despite the circumstances that surround her. She demands the respect she deserves and picks herself up from the ground. Who needs chocolates, flowers, and teddy bears? In this song, Bea asks for diamonds, and nothing else. This sarcastic song uses her anger as a method of empowerment. This feel-good song can be used as a party jam, but also one of those you would blast in your room. Bea is moving on with her life from her past relationship and couldn't feel more relieved to have made this decision. This is one of Bea’s favorite songs to have co-written. It features a slow and more mellow tune with a strong guitar beat as background. The lyrics talk about wasting time, walking the dog, and even making sure she’s home on time to watch “That '70s Show.” The relatable phrases in the lyrics definitely allow her to connect more with her audience through her music and everyday mundane activities. Bea brings honesty to this song, confessing that she doesn’t want to be someone’s girlfriend -- she just wants them to play with their hair. Yes, that’s right! Besides the lighthearted message behind the song and the great melody, the structure is interesting since it switches beginning with chorus and then going into the verses. This is the only song in the album that Bea did not write. Ever been in a relationship that is so predictable? Bea explores this concept and talks about being in a routine and how it can make her restless. The song follows the typical things couples do, from texting each other and hanging out to providing company for each other. It is a song that deals with a couple not taking the next step in the relationship and getting used to what they currently have. Being in a new relationship is not the easiest thing in the world. The video for this song picks up from where “Buy Me Diamonds” leaves off, dealing with the difficulties of having a new love interest, especially in communication and finding common ground. Bea wrote this song for her current boyfriend and all they went through as they started to get close. Bea defines S.L.U.T. as a "Sweet Little Unforgettable Thing". Who would have thought of the meaning of this acronym? The confident version of Bea continues in this song, being true to herself and her identity. The video is an anthem for all females meant to empower and shed light on body and image positivity. The idea of the song stemmed from negative comments she received on Instagram, but she clearly has no time for haters because she is embracing who she is and telling her audience to do the same. The final song, which features Mike Stud, deals with Bea breaking down and setting herself free. The slow guitar intro and the electric beats throughout the song make us feel Bea’s struggle of facing reality and being true to herself and others. She is tired of pretending that problems in the past have not had a negative impact on her and she has decided to let it all out. Bea shows that she is not perfect and is a work in progress and hopes to better herself and relationship with others in this powerful song.